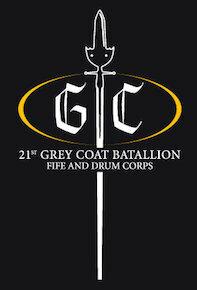 The 21st Grey Coat Batallion Fife and Drum Corps, in short the ‚Grey Coats‘, is one of four Corps located in Basel, Switzerland. It was founded in 2000, just before the beginning of the 21st century. A few ambitious young people decided to take up the Fife and Drum tradition with the following goals in mind: On the one hand, the new Corps should continue the ancient style as it is practiced in New England, but on the other create a contrast to the existing Swiss Corps. After only one year of hard work, the Corps was born, and the first public appearance was dared with only eight members! Since, the group could stack up the lines, and it currently counts 14 fifers, fife drummers, three bass drummers, and a drum major. The members are between the age of 20 and 45 and all have grown up with the local Fasnacht tradition. Some of the drummers have also been part of the successful Top Secret Drum Corps. Our repertoire consists of an extensive list of old folk tunes, new compilations and arrangements, as well as original literature. The traditional jigs, reels, and hornpipes originate in the British Isles and were used – together with the drumming – as military music during the Colonial Campain and the Civil War. Nowadays, when played in nightlong sessions, they have found their way back to their original purpose as folk tunes. Arrangements, medleys and original drum parts come from various sources, be it other corps or independent writers and arrangers. We present ourselves with an exciting show which features skilful precision marching as well as artistic visual elements in the drum section. The Fifers play a 10-hole Blackwood fife in Bflat, manufactured by Skip Healy, Healy Fife Company (www.skiphealy.com). The snare and bass drummers play wooden rope-tensioned drums with calfskin heads by Cooperman (www.cooperman.com). Our uniforms, the ‚grey coat‘, approximate the style of uniform worn during the Colonial Campaign. Copyright © 2019, The Grey Coats. Proudly powered by WordPress. Blackoot design by Iceable Themes.